Christine Fan (范瑋琪) and her husband Blackie Chen (陳建州) announced on their Weibo that they will soon have new additions to their family. Christine is currently pregnant with twins and the due date is February 2015. Her announcement garnered over 250,000 comments, 420,000 reblogs, and nearly one million likes. Many celebrity friends also immediately left comments to congratulate the couple. Christine’s agency released a statement, expressing that they did not realize she was pregnant until she went for an emergency check-up in June. Christine had hit her head and injured her face, sporting a black eye. As a result, she decided to nickname the twins “Big and Little Panda”. Due to Christine’s delicate frame, it was said that the first three months of her pregnancy were rather difficult. She had severe nausea, vomited a lot, and was bed-ridden. She also had vaginal bleeding on her sixth week of pregnancy. At 38 years old, the likelihood of mothers becoming pregnant with twins is 8 percent. There were reports claiming that Blackie and Christine had used other methods for conception. 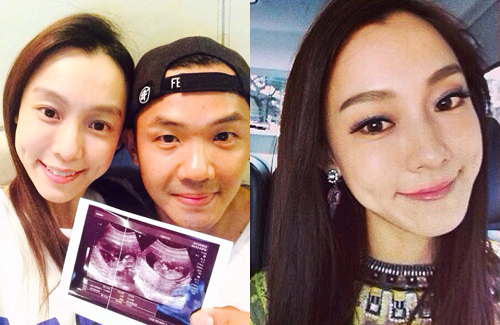 Blackie later clarified on his Weibo that the twins were naturally conceived. However, Christine had taken injections beforehand to stimulate her ovulation. Married for three years, Blackie and Christine always wanted children. In the last few years, Blackie said Christine underwent a lot of stress, which interfered with conceiving. Using ovulation induction processes for conception was the last alternative. Christine originally had plans to release a new album this year and had been consistently recording and writing songs. Due to her pregnancy, Christine is now unsure if she will be able to release her album in time this year, but the project is ongoing. Not one but two babies on the way! Cheers for them! She is a Taiwanese actress and singer. Congratulations!! Happy news. Twins are high risk so hopefully all will go well for them!! Also wanted to add that even if they went through IVF to conceive the babies it is no big deal.. People need to just chill. True and who said that you cannot conceive twins naturally? Congrats to them on their double happiness! That’s good to know! I’ve read that it’s more difficult to conceive after 35yo.. My RE n myself are stressing out! That’s fine.. Many I know has procedures done n fillers n Botox r quite common these days.. I’ll need them in 5 years or so! Fillers I mean.. Hehe..